Watch as That One Guy (yellow) chases down BushMonkey in an epic game of Bumper Tag in the "Kill Death Match" map on ShootMania. After a couple of bumps, we end up colliding and I send BushMonkey sailing off on a holey crusade. Having it happen live, but seeing it this way was hilarious. Enjoy! Stay tuned! 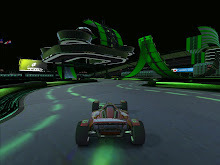 Rumor has it that Nadeo will be releasing full demos of TrackMania and ShootMania in April, so everyone can try all available modes in limited timed sessions. That will let Team FNG show others how fun the game is on our servers before they buy.